Why does the crème brulée of the day have Oreos in it when Oreos do not go in crème brulée? Happy anticipation (on the part of one participant; nodding tolerance for the other) re: the impending start of baseball! season! GO! CUBS! Better to smash obnoxious cell phones with hammers or douse with super-soakers? Unclear. Probability that the 14 years between Pete's birth and his eligibility to go to Philmont actually lasted less time than the same period for Alex. Opinions divided. One fine day in late 1989, a letter arrived in my mailbox. It was written in cipher, which I found a bit surprising, but I sat down and began decoding it. The surprises continued: it was a rather irritated letter, with very peculiar diction, and although I knew it had come from Elwood, the name signed at the bottom had eight letters. It took me a while to figure out that he had encoded and mailed off a letter from Napoleon to Josephine, in which he was saying that she ought to write him more letters. So that was decidedly quirky, right? That could be a little snippet on the forthcoming reality show When Geeks Marry, am I right? But wait! There's more! In 2003 my brother sent us a postcard from a conference. In cipher. Okay, so he did give me D E A R M O L V right off the bat. But astute readers will note that two of the phrases are in German. That caused me a little face-scrunching, as you might imagine. And once I got the postcard deciphered I did a little more face-scrunching: how weird is it that three of my favorite men have sent me correspondence in cipher, just for the fun of it? The NYT Dining section includes a feature called "Front Burner," which describes a variety of foodie items available for purchase. I always skim it slowly, because I can only glance at the paragraphs in between eye rolls. Sometimes the eye rolls are about the expense of the food for sale. I mean, seriously, why would I pay $60 for a cheesecake? Why would I do that? Sometimes the eye rolls are about the preposterousness of the food for sale. If I wanted to make inedible ice cream, I could add my own dill pickles. I don't need to order miso/black truffle sorbet with exorbitant shipping. But today, my friends, my eyes gleamed rather than rolling. Today Florence Fabricant is writing about pumpkin preserves. The Anne Shirley fans among you have probably skipped away, eyes also agleam, in search of the article. In Anne of Windy Poplars, our heroine discovers pumpkin preserves. They are the most delicious food she has ever consumed. Eating pumpkin preserves is like eating sunshine, she writes to Gilbert. The very idea of pumpkin preserves struck me as implausible. How could you turn...a pumpkin...into something like jam? And how could it be delicious? And what was this world in which people ate jam-like things with a fork, at dinnertime? And yet I knew Anne Shirley would never lie to me. In today's NYT there is a little blurb about pumpkin preserves, a new product available from Murray's Cheese Shop. When we went to NYC last summer my husband was especially pleased to visit Murray's. Cheese is one of his favorite indulgences, the smellier the better. If I suggest to him that we should place an order from Murray's he will almost certainly say YES YES OF COURSE! In Windy Poplars the pumpkin preserves episode has an unfortunate ending: so many people feed Anne pumpkin preserves that it begins to taste like death march rather than sunshine. But we could probably avoid that if we served it out by careful (and occasional) spoonfuls. How often does a person have the opportunity to eat the food of her imagined childhood? What are the odds that it will indeed taste like sunshine? I got a Christmas present today: a robot vacuum. I've thought for years about buying a Roomba, but it always seemed a little extravagant. This year, though, Elwood found a deal on one manufactured in China. The instruction manual is in Chinese, but I was able to figure it out from the pictures. (I think.) The woman's voice that emanates from inside the unit also speaks in Chinese. She is much chattier than any vacuum I've ever had before. Unfortunately, I have no idea what she is telling me. After I charged her up, I sent her to vacuum under my bed. She had a lot to say about this. My husband found a deal on a Chinese robot vacuum, which patrols the house and interjects occasional comments in Chinese. Pretty sure it's saying, "Listen, lady, it cannot be good for you to have this much dust under your bed." I have no frame of reference here. She is probably saying, "Please return me to my base so I can charge my battery." Or "please empty the collection container." But it might be "How can you stand to live in this squalid hellhole?" How would I know? The kids have opinions about her too. They think that I will mess with her head if I pick her up and carry her to another part of the house. How can she build a mental map if she doesn't move around under her own steam? They think that when I pick her up she says, "Stop it! Put me down and let me navigate by myself like the manual says!" Except none of us can tell if that's what the manual says or not. She had some comments about the dining room too. I think they were along the lines of "Why are there NINE chairs in this room? Are you feeding a baseball team around here?" Huh, perhaps it is revealing that I imagine my robot vacuum composing an angry haiku when required to deal with the evidence of my cursory housekeeping habits. I...might decline to think about that. I found an English blog post in praise of this brand of robot vacuum, with instructions for downloading a Chinese-language app that will allow me to connect my personal robot vacuum to the internet. That way, the writer tells me, I can instruct her to get to work while I am away from home. I can't be the only person who finds this a little head-scratch-y, can I? I can't be the only person who imagines a robot army, taking over Gladlyville (and thence the WORLD) from footholds gained by pretending to be agreeable domestic assistants? Okay, I might be the only person imagining that. I was trying to be helpful, you guys. Usually the Christmas tree is a joint effort, and Elwood is the person who handles the sawing parts. But today is Christmas tree day, and he was making a quick run to pick up some last minute groceries. So I sent the 15yo out with the saw. He cut off a narrow ring from the bottom, as requested, and I brought the tree in myself. "Wow," said Pete. "You can pick up the tree in one hand?" I was feeling kind of macho, I must admit. We worked together to seat it firmly in the stand, and make sure it was straight, and tighten the bolts symmetrically. We decorated it in a cloud of nostalgia, chattering about favorite ornaments. Pete brought it a drink, and shortly afterward it occurred to me that I should see whether it had enough water. And then I discovered my error. Since I'm not usually in charge of the sawing parts I forgot that there are sawing parts, plural. You don't just saw a ring off the bottom; you have to make sure there's enough naked trunk to slide right down to the bottom of the stand. You have to saw off any branches growing too close to the bottom. So when the boys and I agreed that the tree was firmly seated in the stand, what was actually happening was not that the trunk was resting on the bottom but that those lowest branches were preventing further descent. The result: a three-inch gap between the bottom of the tree trunk and the puddle of water in the bottom of the tree stand. I thought briefly about taking off all of the ornaments and all the lights and removing all the bolts and sawing off the branches and doing it all over again. Instead we just added a lot of water to the stand. I mean a lot of water. Our house elves could bathe in there, if we had any house elves. If we still had little bitties this strategy would be spell certain disaster. We'd wind up with spilled water or toppled tree or maybe both. But I think we're out of the tree-toppling years, and I think we'll be able to keep enough water in the stand to prevent the tree from drying out and setting our house on fire. I'm even optimistic that we'll be able to keep the water from splashing onto the presents lying all around, though that may be more optimism than the situation warrants. Next year I will vote for a return to our usual division of labor. Play to your strengths, they say. Things were quiet in the bedroom wall for a while, but our visitor is back. I left a message for an exterminator after my last rodent post, and he left a message for me, and then I kept writing "call exterminator" on my to-do list and not doing it. Today, though, I was awakened at 5:30 by a four-legged friend, and I called Nate the exterminator as soon as I deemed it polite. He called me right back and wanted to know more about the problem. He thought it sounded more like mice than a squirrel, based on my description. "The things about mice, though," he added, "is that they breed in the walls." "Oh, no," I told him. "No, no, no, Nate. This is a celibate mouse. I am sure of it." Nate is going to come back with bait. "It will get rid of mice," he said, "and voles if you have them. Or if you had rats--" Here I cut him off. "No rats," I said, channeling Edna Mode. He raised an eyebrow. "No rats are allowed," I continued. "I have created an anti-rat perimeter by the power of my mind." Most of the time I know not to say the very goofiest things that churn up out of the depths of my brain, you guys, but here at the tail end of the semester my filter is sometimes less than adequate. Over in my sidebar there are matching family pajamas: red and white striped bottoms, with tops that say "Believe!" The I in "Believe!" is a Christmas tree. I see them and I die a little inside. My family would like some nice matching pajamas that say "Take down that stinking Christmas tree -- it's not even Advent." Or perhaps "It's only the middle of November. Go contemplate your eventual death some more." I am sure those will be a hit. Oh! I just clicked refresh and the very next ad was for a capelet -- a wine-colored asymmetric capelet trimmed with fake fur. I scratch my head at this. Earlier this fall I was lured in by some sidebar ads. I blogged about the Brave dress; I also bought a clearance green and white dress from Boden ($24! free shipping!) and a sage green sweater dress from Buykud. Whoever was writing the algorithm in October was knocking it out of the park. Was that you, November coders? Did you say to yourselves, "Green dresses are too easy. I bet we can persuade Jamie Gladly to dress like the bag lady version of Maleficent!" Hard pass from me on the bag-lady Maleficent look. I'd prefer aluminum foil outerwear. I keep refreshing, mystery coders, and new horrors continue to unfold. I am astonished by the array of Santa clothing available to grown women. I suppose it's an improvement over the summer ads, when you were trying to sell me incontinence products. No more of those, please, November coders; my bladder and I are fine. My wardrobe and I are also fine. If this keeps up, though, I might need some more aluminum foil. I took the eShakti plunge recently and my dress arrived this week. There are so many eShakti coupons floating around that it wound up being really reasonable. And it's so pretty. I wore it to work today. "Dr. Gladly," one of my students exclaimed when I walked into class today, "have you seen Brave?" Yes, I told her. "You already have her hair," she continued, "and now you have her dress too!" I am the middle-aged bifocal-wearing version of Merida. I am all done with the solo portion of the grad class. My co-instructor and I are teaching together on Monday, and then I have a bunch of stuff to grade. And then! No more 8:00 classes for me! I hope I can continue the practice of getting into the office at 7:45, but I won't be doing it because a room full of students awaits me. Did you see the thing floating around on Twitter where your rapper name was Young + the last thing you spent money on? I could be Young Plumber. (Kitchen sink, streaming water into the basement on Monday night.) Or Young Rear Control Arms, in honor of the surprisingly expensive car parts we replaced this week. Or Young Front Tires, because failing rear control arms will wear your tires out prematurely. Fame awaits me as a rapper, I feel certain. Let's hope money awaits me too, because it's been an expensive week. I might also get to be Young Exterminator. Last night, you guys, there was something scritchy-scratching around IN MY WALL. BY MY HEAD, in the place where I lie down in order to SLEEP. I think maybe a squirrel found its way into the walls somehow? But I don't know for sure? It sounds too big to be a mouse. We have a running family joke about critters in the ductwork -- not just our bunyip but also a whale. (It's a long story.) Just in case any neighborhood critters have been listening to our dinner conversations: we do not welcome visitors in our ductwork. Or our walls. Elwood is going to climb up on the roof tomorrow to see what he can see. I can't spot any gaps in the siding that could admit a squirrel. Wish us luck. I shouldn't be too complain-y about this week, though, because guess what? The Journal of Human Lactation accepted my paper! JHL! is publishing my sole-authored manuscript! So that's really excellent. Maybe I shouldn't complain about the car/plumbing/squirrel in a week with such a happy piece of news. Into every life a little squirrel must fall, and all that. So I won't complain, but I will share a little bit of weirdness: I am the only person who has heard the scritchy-scratching. I tried to share the experience with my 17yo and my husband, but no dice. Silence. Last night I thought to myself, "What if it's, like, a ghost squirrel? Or a rat? Or a WRAITH-LIKE WOODCHUCK in the WALLS?!" Light & Momentary, home of the revenant rodent. The last time I switched purses, I downsized. I had to get rid of my pencil box and little notebook because they just wouldn't fit in my new purse. I remember holding the pencil box in my hand, thinking, "I will want to use this again when I buy my next purse." And then? I do not know. There is only a void encircled by frustrated question marks. Past Me did not stash them in an old purse, or in the drawers with office supplies, or on the art supply shelf, or in her sock drawer. (I was getting a little desperate.) She did not put them on a school supply shelf, or in the laptop bag, or in the dishwasher. (Like I said, desperate.) It is possible that Past Me put them somewhere sensible, at least by her standards, and then Slightly More Recently Past Stella relocated them. In that case I'll only find them when we move out. Putting things away does not seem like a super-complicated skill. I'm not trying to learn to play the oboe here, folks. I'm not pursuing the world's one-armed curling championship. And yet I am here to tell you: the fact that papers are filed, or objects are put away, does not mean that the filer/putter-away-er has done her job well. Just ask my sleek and burping bunyip. Two years ago I unwittingly made a great purchase. Sierra Trading Post had a pair of black leather Teva sandals on clearance, and I bought them. I bought them because my other sandals were falling apart and they looked like a reasonable choice, but they have turned out to be the Best Sandals Ever. I like them because they are nice enough to wear to Mass or work, but not too fancy for shorts and a T-shirt. They are practical -- no heel, sturdily made, extremely comfortable -- but not chunky like Birkenstocks. I can't even count the compliments people have given me on these sandals. I certainly can't count the number of miles I've walked in them. It's probably no surprise that they're wearing out. The trouble is I didn't realize just how deeply discounted they were, and I am wincing at the cost of replacing them. Do you have any sandal recommendations for me, my friends? Here's a picture of the ones I love. Oh my goodness, friends, I just smote a centipede that was, like, 6 inches long. Okay, really and truly, it was only 2+ inches long. But it was climbing the wall in my shower! Do you know what happens when a very nearsighted person gets into the shower with a big bug? She leans in close to see what that big dark smudge is, that's what she does. Just ask the person who still gets the shudders thinking about her up-close shower encounter with a silverfish in 1990. Gah! I just did an image search for silverfish, a beastie I'd never encountered until I moved to the Midwest. It was going to be a friendly blogger thing, in which I said, "Here, let me show you what I'm talking about just in case you're unacquainted with the silverfish." But it turns out the friendly blogger course of action is to close the tab and step away. And bleach the brain. There are too many bugs in this world, my friends. But! Back to the point: there is one less bug in the world than there was earlier this evening. I started to ask for help, but then I remembered something Elwood said to me years ago when there was a different big ugly bug causing me a different flavor of distress. He said, in a voice both kind and disbelieving, "Jamie, you have been through childbirth five times. You can handle a bug." I repeated these words to myself. Jamie, you have been through childbirth five times. You can handle a bug. I fetched the WMD (Weapon of Millipede Destruction in this instance; I cannot distinguish between a centipede and millipede reliably but I do know that WCDs are not a thing). My flyswatter was no match for its exoskeleton, but as it wriggled, stunned but clearly plotting its revenge, I crushed it in my fist* and laid its carcass on the pyre** for destruction. I was going to write another post about plans and productivity tonight, but sometimes duty calls. Or sometimes duty slithers up the the bathroom wall, lurking in the shower curtain. I am waiting for the king to send a herald offering me half the kingdom and the prince's hand in marriage. I'll have to tell him I'm already married, but I expect a savvy financial guy could translate half the kingdom into our next college tuition payment. I just saw Wonder Woman. Have you seen Wonder Woman? Can we talk about Wonder Woman? Tonight I told my daughter she could brush my hair while I read Mysterious Benedict Society to her. I do this about once every other year, because it is a recipe for eye-watering discomfort and eye-popping frizz. You guys, I spent the first TWO DECADES of my life thinking it was a hygiene fail if I didn't brush my hair at least once every day. Why would my parents want me walking around in the world like this? Were they secret members of the Roseanne Roseannadanna Fan Club? 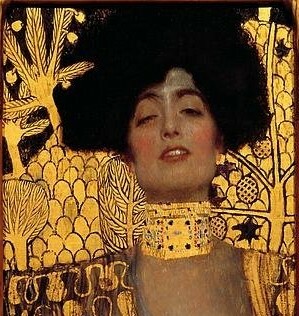 It also reminds me a little of the Klimt Judith painting, only with less decapitation. I thought occasionally about auto-decapitation in junior high, especially in the spring when the returning humidity hit hard. My hair would attempt to fling itself aloft like the fledglings, except it did so while still securely attached to my head. You might think that a haircut would be a better remedy than auto-decapitation, but maybe you have forgotten what junior high was like. If you are the parent of a girl with curly hair, I have some advice for you. First, take her hairbrush outside and set it on fire. Go. Are you done? Good. Next, get a copy of Curly Girl and heed its advice. In a nutshell, don't work against what God gave you. If you don't dry it out, it won't fly away in search of hydration (i.e., co-wash instead of shampooing). If you can teach the hair to be friends with its neighbors, then it won't feel the need to flee the premises (i.e., ditch the mainstream anti-frizz products). This picture was taken on a sweltering humid August day immediately after a terrible haircut, and it makes me say, Dear 1982 Jamie, one day your hair will lie down in an approximation of flat. You just have to set your hairbrush on fire first. This evening I wasn't really thinking about the terrors of junior high with gravity-defying hair until my 17-year-old said, "You know, I think I'm glad I missed out on the curly red hair thing. Straight blond lies-flat hair is good for me. But I probably carry that gene, right?" Genes are complicated, I told him, but it seems likely that if he marries a redhead they might encounter this hair again. I'll keep my copy of Curly Girl at the ready. I'll be like Edna Mode, announcing "No brush!" We have dark dark fierce chocolate and it is delicious with the date-coconut rolls that are also living in the pantry at the moment. I am reading a book that Kira recommended when it was on sale in the Kindle store. Oh, look, it's still on sale in the Kindle store -- $0.99. Go buy it. It's really good so far. I am a little embarrassed to admit that I have a soft spot for books with smart redheaded heroines who are slightly awkward, but I bet you'll like it even if you don't share my bias. Have I recommended The Boy Who Loved Math to you before? It's delightful. Ummm, I am struggling to come up with a grading update that maintains the bright spots theme. Ummm, the undergrad exams are going faster than I thought they might? The disappearance of my online gradebook means that my grad students can't see how behind I am on grading their projects? Let's move on, shall we? I rode to the women's retreat team meeting tonight with a woman I didn't know very well. We had the most pleasant conversation, ranging from fluffy to deep. I'm glad I asked her for a ride. I am heading to bed in hopes of eradicating this lingering respiratory crud. Good night, all. The thing that is really on my mind tonight is a frustrating work situation. I cannot think of an oblique way to express my frustration that does not lurch immediately into Imprudent blogger territory, so I'll just say this: I'd appreciate your prayers for a peaceful resolution. Nestled between the black beans and the chipotles in adobo, I spotted two cans of haggis. Haggis, in the Midwest! One of the big surprises of our two years in Scotland was the discovery that haggis is really tasty. Americans hear "made of sheep lungs" and assume it must taste like putrescence and despair, but it turns out that sheep lungs are totally delicious. My husband misses haggis. I'm not convinced about haggis in a can. I'll have to keep you posted. We always have tatties and we often have neeps, but this is the first time in >16 years that we've had haggis in the house. I was looking for videos for my students on Youtube when Youtube thought I might need a distraction. "Look, Jamie," said Youtube. "Wouldn't you like to watch this tiger mom in action?" This is going to sound a little nuts, but I was watching her move with a contraction and thinking that some things resonate across species. (Okay, that sounds more than a little nuts, but I'm just going to leave it there.) And then...she broke her own water. With her teeth. Some things emphatically do not resonate across species. If you happen to need a distraction yourself, I give you two fluffy squeaky tiger cubs and a wee bit of drama. Plus Australian accents. My kids have strong ideas about the One Right Way to do Christmas Eve. The tree cannot be decorated until Christmas Eve. It is better if the tree is not purchased until Christmas Eve, but sometimes a little flexibility is required on this one. There must be fish for dinner. We are not even remotely Italian, but we still make Italian cookies and eat fish for dinner on Christmas Eve. It's an appreciative sort of appropriation. After dinner on Christmas Eve it is time for one round of presents. Small sisters who lobby to open more than one present on Christmas Eve must be told in kind but firm big-brotherly tones that the other presents are for tomorrow. Midnight Mass is the best mass.